BYDS | Me fail? I fly! If you live in Sydney, you ought to know about two fabulous things coming soon. Hidden is an outdoor sculpture exhibition that takes place amongst the gardens and graves in one of the oldest sections of [Rookwood] Cemetery. The exhibition invites artists to ponder the notion of history, culture, remembrance and love and allows audiences to witness creative expression hidden throughout Australia’s largest and most historic cemetery. This year the Emerging Artist formerly known as the Art Student is part of the exhibition. Her piece, Bush Memorial, comprises two giant ceramic banksia seeds. Yesterday we installed it. This isn’t professional/industrial theatre, where success is judged by the length of the run and size of box office takings. It’s community, where the division between audience and performers is porous, where there’s an intimate sense that people are telling their own stories and those of their neighbours. There’s a wonderful scene where a group of boys are teasing/harassing a group of girls, who are giving back as good as they get. In the middle of the chiacking and posturing one of the girls looks one of the boys full in the face and says, ‘Hello!’ and the group falls silent. The whole thing falls apart, moves onto a different plane. Sure, it was scripted and stylised, but it felt like it was really happening right then and there. 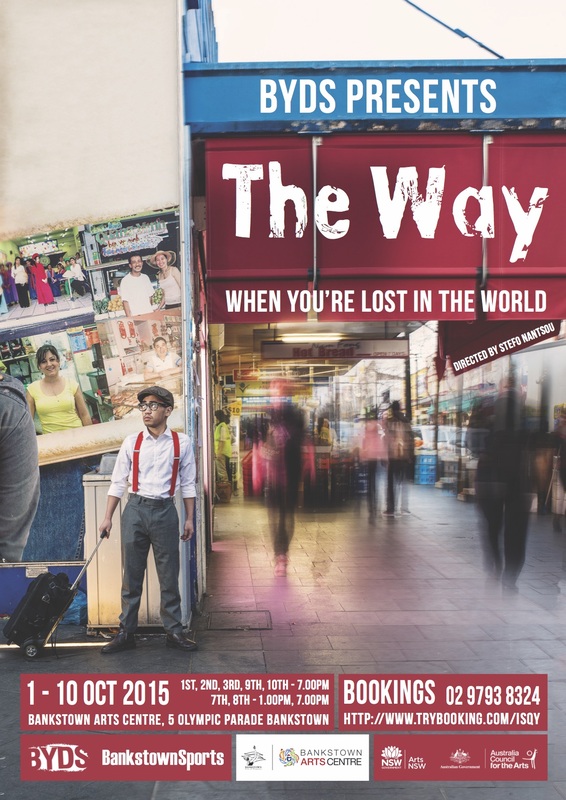 I gather that The Way has a similar structure to its predecessors: over a single day in Bankstown, storylines intersect as people from diverse backgrounds experience their multitudinous joys and crises. I’m looking forward to it. 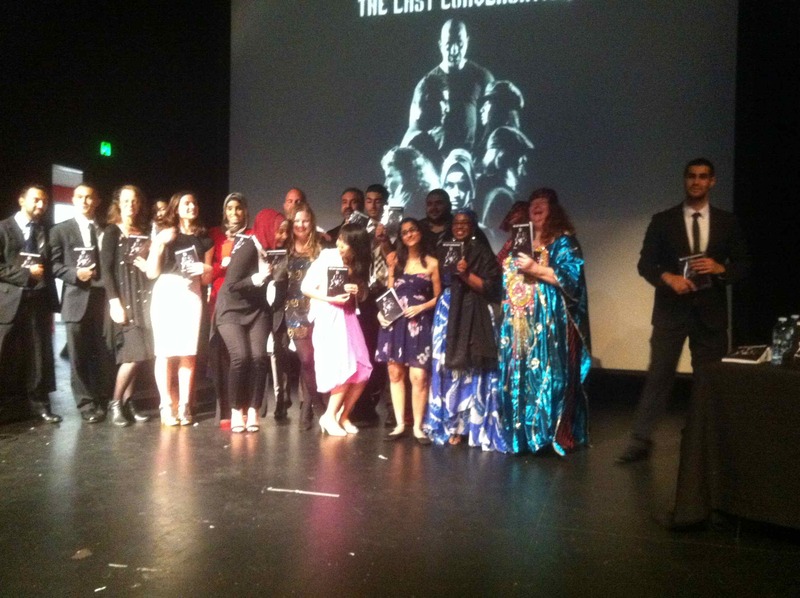 The Last Conversation was published last December as a way of capturing something of the slam’s first exhilarating year. I blogged about its launch. As I’ve just read it cover to cover for the first time, I find myself thinking of it as a record of poetry – a book that hasn’t really been read until it’s been read aloud, with full attention to rhyme and assonance, and a hip-hop-like exaggeration of rhythmic effects. And maybe that’s true of any book of poetry. Mostly my theatre outings are relegated to the blog that appears in the right-hand column here. But as very few of my readers will have a chance to see The Other Way, here it is in the main body. The Other Way, written and directed by Stefo Nantsou, is the third annual collaboration between the Sydney Theatre Company and Bankstown Youth Development Service (BYDS). The ABC’s inferior replacement for Ramona Koval’s Book Show (no disparagement of the excellent Michael Cathcart intended – the Powers That Be seem to have declared non-fiction books to be off limits, a stupidifying limitation) ran an interview yesterday with three people involved in the show, which you can hear here. 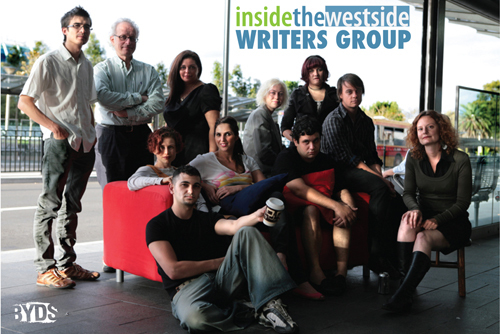 The show’s cast includes five professional actors, 23 school students and seven other performers from the community, some of whom wrote pieces On Western Sydney (Westside Publications 2012), an anthology of writing from and about Western Sydney edited by Michael Mohammed Ahmad & Felicity Castagna and produced under the auspices of BYDS. I mention the anthology because, although it wouldn’t be fair to say the show was based on it, there is a shared agenda of putting Western Sydney stories and story-makers into the public eye. The action takes place in a single day, beginning with an old man summoning his family to prayer and ending with family prayer at night. In between, we see people commuting by train and going about their work days. Three main stories unfold, each involving children lost and found. In the most lighthearted, a woman loses her two small children in a shopping centre and they turn out to have been hiding for the fun of it. A second involves children being removed from a junky mother by Community Services and given into the care of a decent, loving couple. The third, which involves the family from the opening moment and nosy teenagers acting as chorus, has a young woman returning to the family after being missing for a long time. Alice Ansara has some big emotional moments of rock bottom despair as the junky mother, but it’s the story of the young woman returning to her family that is at the heart of the show. The responses of her siblings, her parents and her grandfather are richly complex (not glibly joyful, by any means). Only at the end do we discover why she left, and it’s a powerful statement about the difficulties faced by a generation caught between cultures and the vicious effects of anti-Muslim prejudice. Binding it all together is brilliant hip-hop artist Matuse. He’s part of the family that prays; the returning daughter tells him her story; his songs provide the time frame and an exuberant conclusion; and his encounters with a little thief are a running joke whose punchline evokes not a laugh but breath of hope. This isn’t professional/industrial theatre, where success is judged by the length of the run and size of box office takings. It’s community, where the division between audience and performers is porous, where there’s an intimate sense that people are telling their own stories and those of their neighbours. There’s a wonderful scene where a group of boys are teasing/harassing a group of girls, who are giving back as good as they get. In the middle of the chiacking and posturing one of the girls looks one of the boys full in the face and says, ‘Hello!’ and the group falls silent. The whole thing falls apart, moves onto a different planet. Sure, it was scripted and stylised, but it felt right then and there. Just before the show started, a section, not of the audience but of the cast. I didn’t get my hands on a program so can’t say names, but from the left: a young man who did spectacular leaps to impress a young woman; two players of multiple minor characters; the junkie mother / train ticket collector; younger sister of the returning young woman / girl who was impressed by the boy’s athleticism; neglected son of the junkie; Community Services worker / mother of the praying family / drummer; mother and two children from the lost-in-the-mall story. The Other Way is on again tonight and tomorrow night and tomorrow morning (that is, Wednesday 17 and Thursday 18 July) at the Bankstown Arts Centre where tickets cost $5 or $3 (book at 02 9793 8324), and then Friday evening and Saturday afternoon at the Wharf 2 Theatre at Walsh Bay where there’s no charge, but bookings are essential (02 9250 1777 or online) and maybe impossible. 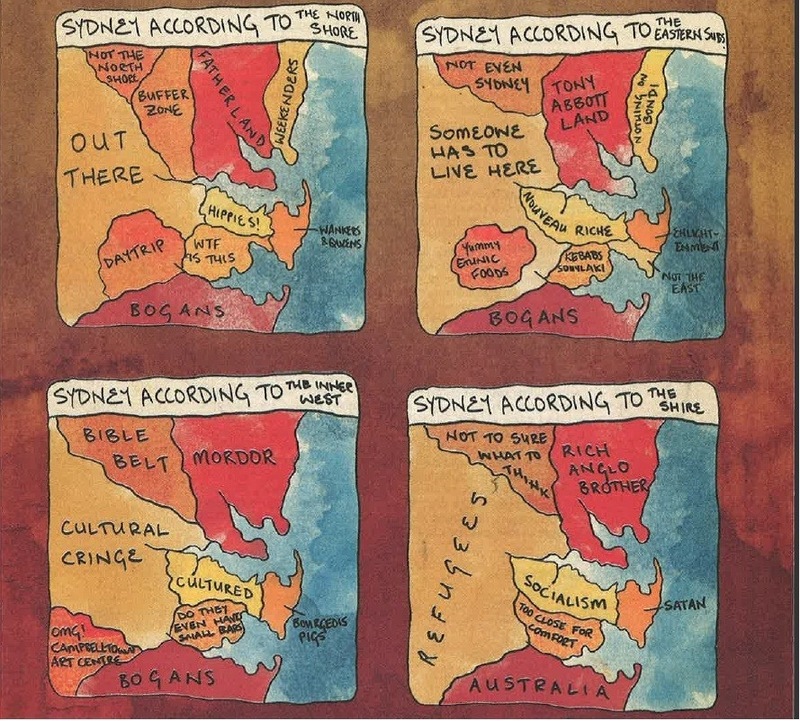 In early 2011, an issue of the University of New South Wales’ student newspaper Tharunka had a cover illustration of maps of Sydney according to four different regions. Like Yanko Tsvetkov’s stereotype maps, their probable inspiration, they manage to be cheerfully offensive about just about everyone, but you’d have to be thin skinned to take serious umbrage. All the same, look at Western Sydney: ‘out there’, ‘someone has to live there’, ‘yummy exotic food’, ‘cultural cringe’, ‘refugees’, ‘day trip’. The anonymous cartographer has caught something, but if you stop and think for a bit you realise that he/she/they has/have surely pulled her/his/their punches, avoiding any references to drugs, sexual violence, Islamophobic stereotypes or the class attitude invoked by the word westies. More interestingly, there is no ‘Sydney according to Western Sydney’ map. Evidently, in the mind of the maps’ creator(s), Western Sydney lacks a view of its own. Under the auspices of BYDS (Bankstown Youth Development Service), Westside has work for years in schools and the community to develop skilled writers. On Western Sydney is their twelfth anthology featuring established and/or emerging writers and artists connected to the region. Ahmad says the goal has been ‘to source writing from Western Sydney and writing about Western Sydney’. Of course it’s not the only place where writers from Western Sydney get published – in my time at the School Magazine, for instance, some of our regular contributors were from the west, and off the top of my head eminent poets Jennifer Maiden and Peter Minter have strong Western Sydney connections. And a number of the writers in this anthology have been published elsewhere, including in the definitely Inner West This is the Penguin Plays Rough Book of Short Stories. But there’s no doubting the significance of Westside. Last week Mohammed Ahmad received the Australia Council’s Kirk Robson Award which honours ‘outstanding leadership from young people working in community arts and cultural development, particularly in the areas of reconciliation and social justice’. So On Western Sydney is a phenomenon. It’s also a good read, and not at all the dry sociological collection the title might suggest. It includes short stories, poetry, absurd parables, a photo essay; there’s lyricism, satire, rap, stinging social commentary, domestic observation, fantasy, memoir (I think), travel writing … from as culturally diverse a bunch of writers as you’re likely to find anywhere. Many of the contributors are familiar from Westside’s readings at recent Sydney Writers’ Festivals, and scattered throughout are Bill Reda’s photos of Moving People, this year’s event. with its bare stumps grinning cruelly in the heat. My guess is that the writers are mostly under 35. The problems of negotiating relationships is a dominant theme: under the judgemental gaze of older Arab women in Miran Hosny’s ‘The Weight Divide’; by phone in Michael Mohammed Ahmad’s own brief contribution, the deeply unsettling ‘The First Call’; in the gap between the world of song and the world of experience in Luke Carman’s ‘Becoming Leonard Cohen’ (though it’s pretty impertinent to describe Carman’s weird tangential verse as about anything); in bitter-sweet recollection of a high school crush in Tamar Chnorhokian’s ‘Remembering Leon’. There’s so much to like. We’re told that this will be Westside’s last print publication. Maybe there’s a sense that its work is done, and the writers it has fostered can now find platforms further afield – in Asia Literary Journal, for example, whose current issue has a number of pieces exploring migrant identity. I hope so. I received my copy free from BYDS. You can buy one from independent book shops in Sydney or directly from BYDS (email in@byds.org.au with your postal address and they’ll give you details on cost and bank transfer details). 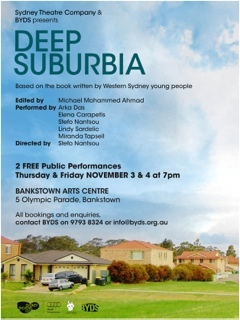 The show in the rehearsal room of the new Bankstown Arts Centre last night was all about Western Sydney, when five actors from the (not-Western) Sydney Theatre Company presented Deep Suburbia. In a nutshell this was a theatrical presentation of work from an anthology of the same name published earlier this year by the Bankstown Youth Development Service (mostly known as BYDS – I had to look up its full name). of the 3:14 to Granville. to longer tales of family life, or classroom romance/politics. Last night was something of a revelation. The performers – Stefo Nantsou (who also directed), Arka Das, Elena Carapetis, Lindy Sardelic amd Miranda Tapsell – read the pieces with intelligence, humour and moments of great poignancy. They played around with form, so that the evening had a shape – among other things, the show finished with Filip Stempien’s enigmatically named ‘New Zealand Boys Drum’, a string of glimpses of the varied life of Bankstown, and we realise that a number of these glimpses have been acted out for us in the interstices of earlier readings. 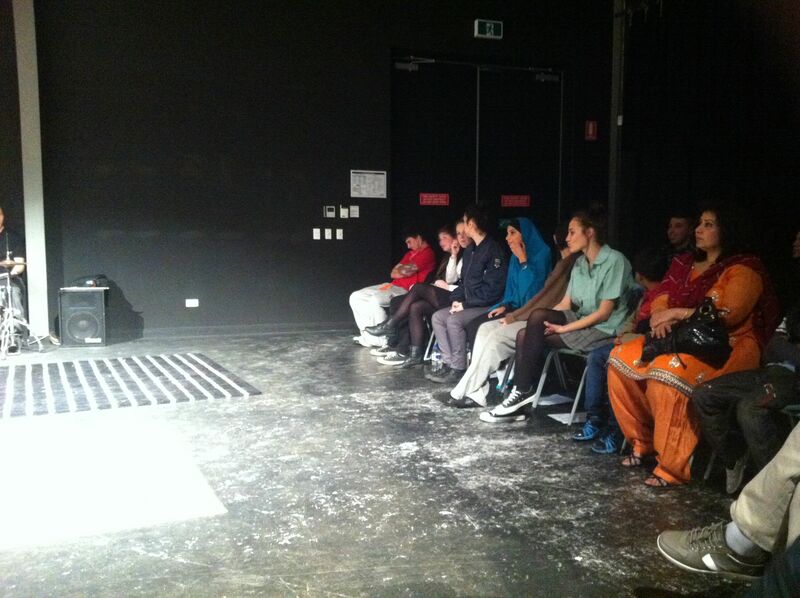 Most interestingly for me, the performances demonstrated something about the nature of young people’s writing. There were a couple of pieces, for instance – a rant about how annoying girls are (by someone who chose, perhaps wisely, to remain anonymous), a step-by-step account of a day spent obsessed with a boyfriend’s perceived bad mood (also anonymous), Kameron Omar’s recount of his mother’s time in hospital with an aneurysm – that one might be tempted to read as artless scribblings on the page, interesting mainly as sociological data. In performance, the depth of their creativity became blazingly evident: ‘Girls These Days’ sounds like Henry Higgins as Pizza Boy; ‘I Write to Remember’ does a brilliant job of mocking the thing it enacts; the beautifully understated ‘Aneurysm’ is permeated with quiet terror. The show was only on for two nights. It was free, and food was provided. I’m sorry you didn’t make it. I’m very glad I did. One of my highlights from last year’s Sydney Writers Festival was a staged reading in Bankstown Town Hall by members of the Westside Writers Group. Naturally, we trekked west in the rain to see what they were putting on this year. A big room in Bankstown Youth Development Headquarters had been set up with a couple of sofas, cushions, a standard lamp and a coffee table for the group and seats for the audience in the rest of the room. They proceeded to have a meeting like the ones they’ve been having every fortnight for years: each member of the group read a piece she or he had been working on – some brand new, some reworkings or extensions of things the group had heard before. It was a risky idea, and could have failed in any number of ways. But it was great. All the writers have been trained in reading to an audience, and as their mode of working is to read to each other rather than circulating printed copies of their work, they have all become skilled listeners. So we were treated to a lovely range of readings, and then some tender but forthright exploration of what made each one tick and where it could be improved. Luke Carman and Michael Mohammad Ahmad were the stand-outs for me, the former with another of his strangely surreal monologues/stories, the latter with a vignette (a word evidently much discussed by the group) of life in a small ethnic community in the western suburbs. Nothing was dull: sestinas by Lachlan Brown, other poems by Fiona Wright, Lina Jabbir and Rebecca Landon, stories by Susie Ahmad, Sam Hogg, Felicity Castagna and Peter Polites (the dark-haired man on the couch in the pic, shaven headed and unrecognisable on the night), and video in the making from Bilal Reda. All this with the delicate, respectful probing and prompting of Ivor Indyk, resident literary guru. And you know, from where I was sitting none of these young writers seemed at all fazed by having an audience of roughly fifty people watching and listening from the shadows as they exposed the fruits of their imagination to one another’s critical gaze.